I had a strange incident the other day. I was reading a book. I had already eaten an unhealthy breakfast and I wanted to munch on something else. I walked to the kitchen and I KNEW that I wasn’t hungry. I tried to think of something healthy to eat while I was reading and then I remembered that I could chew a piece of gum. Mike ALWAYS has gum in the treat cupboard, so I pulled out a packet. I was feeling greedy, so I took out two pieces. I chewed them for over an hour and I didn’t feel like eating anymore. It helped me get past that. I remember chewing gum when I was in high school. I chewed it EVERY day. I ALWAYS had gum. I rationed out the pieces to last all week until I had money to buy more. I wasn’t allowed to chew it in Spanish class and I remember furtively hiding it under my tongue so that Mrs. Linares wouldn’t be able to tell. To this day, I can talk flawlessly (in two languages) with a stick of gum under my tongue. I stopped chewing gum when I married Mike. He doesn’t really like the habit, especially because I pop it and blow bubbles continually. He considers it noisy and disgusting, so I got out of the habit. 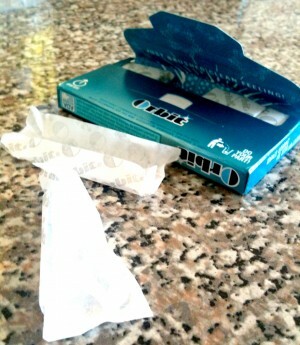 The thing is, however, is that gum is REALLY good at distracting me from eating. It gives my mouth something to chew. It makes my teeth feel clean. It makes me not want to eat, because I’d have to throw my gum away. I should have never given it up and now I’m fully intending to start chewing again. I used to chew gum ALL the time. I would ALWAYS have a pack in my purse. After every meal, I would start chewing again. Quite frankly, I miss it. It might even be the reason I keep eating past the point of fullness. I want to keep on chewing, not eating.